What was the last big project they finished? How long was it forecasted to take? What was the overall result on their business? As smart as these business owners are, and no matter how high their Intelligence Quotient may be, they almost always have a low implementation quotient of making their goals into reality. In fact, some of them cannot even articulate their goals, be they short- or long-term, personal or professional. Knowing your goals and making them a reality is the only “IQ” I care about. What is your Implementation Quotient? While you may be busier than ever, are you actually reaching the goals that are most important to you? Many entrepreneurs I speak to are on autopilot; they often have no real endgame or succession plan in mind. This lack of focus or clarity can lead to crises at work that, in turn, cause an unbalanced personal life. An unbalanced personal life can lead to poor decisions at work, which can end up perpetuating a vicious cycle. Some business owners have a high implementation quotient at the office, but not in their personal life. They aren’t clear on what really matters to them at the end of the workday. They are highly productive at work but fail to set or achieve important goals outside of work, like sustaining a happy marriage, sharing a close relationship with their children, or simply taking the necessary time to recharge their batteries. In my New York Times Bestselling book, "The Sustainable Edge," we present the IQ Grower Process: 15 Minutes a Week to a Higher Business IQ. The process helps readers live in the moment, so they can really enjoy the miracle of life. So often people miss out on the moment because they are caught up in doing what they think they should be doing and not what really matters to them. By pinpointing the activities on which you truly want to spend your time, it will be easier to say “yes” to them and “no” to the activities that drain you and distract you from your goals. If you are not sure what you really want to do with your time, answer the following questions that may help you identify the most meaningful activities for you. What do you do extremely well? What activities give you a great feeling of satisfaction and fulfillment? When you feel empty and directionless in life, what is missing in your life during those times that is causing you to feel that way? If you received $1 billion what would you be doing and how would you use that money? Once you’ve decided what you should be directing your time toward, it's time to implement. In the Essential Six exercise, you will identify your top six professional priorities for each day; the Most Vital is the big goal you must accomplish for the week. Before you leave the office at the end of each day, list the Essential Six important things you must accomplish the following day, in order of importance, and add them to your calendar. Doing this the night before allows your subconscious to begin to work on your tasks in advance — to prepare for the day ahead. Begin your day by tackling item number one on your list. Do not move on to number two until you have successfully completed the first task. Repeating this process each week directs your focus and your time toward your passions. Don’t let a low Implementation Quotient stand in the way of your high Intelligence Quotient. Challenge yourself to focus on your most important goals and make progress towards them every day. By getting clear on what’s most meaningful to you and creating a framework to make it happen, you will find more balance in your personal and professional life. 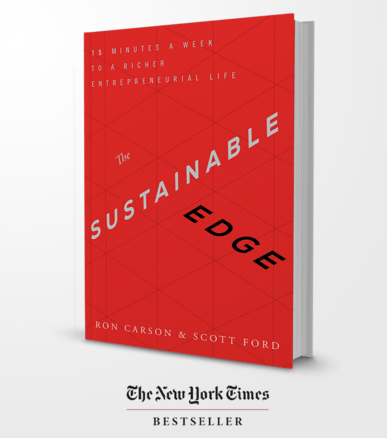 The Sustainable Edge: Fifteen Minutes a Week to a Richer Entrepreneurial Life was written for business owners who are seeking a fuller, more rewarding work-life balance. In this easy-to-reference, practical guide authors and entrepreneurs Ron Carson and Scott Ford share personal anecdotes to their own career successes. Each chapter is designed to inspire business owners to define and sustain a competitive edge in the complex, fast-changing world of business. Order your copy now at www.thesustainableedge.com. Ron Carson is the founder and CEO of Carson Wealth Management Group, one of the largest wealth advisory firms by assets under advisement in the country, serving clients through holistic financial planning, disciplined investment strategies, and proactive personal service. He is one of the most celebrated and respected financial advisors and executives in the industry and is a sought after speaker, thinker, and investment strategist. Ron and his wife Jeanie have three wonderful children and reside in Omaha, Nebraska. Securities offered through LPL Financial, Member FINRA/SIPC. Investment advisory services offered through CWM, LLC, a Registered Investment Advisor. LPL Financial is under separate ownership from any other named entity. Third party content found on this site does not reflect the views of LPL Financial and have not been reviewed by LPL Financial as to accuracy or completeness. For a list of states in which I am registered to do business, please visit carsonwealth.com.